Tumors of the liver may be either malignant or benign. 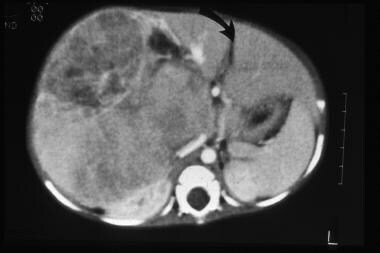 The liver is the third-most-common site for intra-abdominal malignancy in children, following adrenal neuroblastoma and Wilms tumor. The incidence of primary malignant liver tumors per year is 1-1.5 per million children in the United States. This yields a relative low rate for hepatic tumors (1.3% of all pediatric malignancies). Of these malignant tumors, hepatoblastoma (HB) and hepatocellular carcinoma (HCC) are the most common and account for two thirds of all hepatic neoplasms. 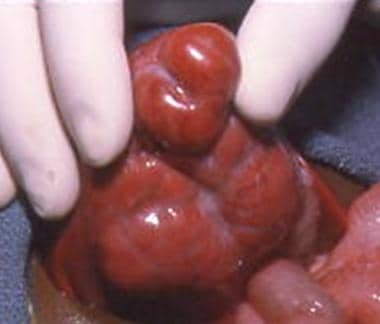 Benign liver tumors include hemangiomas, hamartomas, and focal nodular hyperplasia (FNH). Most children with liver tumors present with abdominal distension, a palpable abdominal mass, or both. Anemia, thrombocytopenia, and leukocytosis are sometimes present. Children with both HB and HCC may also present with weight loss, fever, and anorexia. Laboratory studies are performed to assess baseline CBC count, electrolyte levels, liver enzyme levels, liver synthetic function, and α -fetoprotein (AFP) levels. AFP levels are elevated in 50%-70% of children with hepatic neoplasms, and multiple studies confirm that AFP is a valuable surveillance marker in children who have previously undergone hepatic resection for malignancy. The initial workup for hepatic masses includes radiographic assessment using ultrasonography to confirm the location and to characterize the consistency as cystic or solid. Cystic or vascular lesions may not require any further imaging. CT scanning and MRI (MRI) of the abdomen and chest are used for indeterminate or solid lesions to further delineate the location, extent, and multiplicity of the lesions and to detect metastases. These modalities facilitate surgical planning and may determine resectability; however, definitive diagnosis can be proven only through biopsy findings. Hemangiomas are the most common benign liver tumors in children and commonly occur within the first 6 months of life. They have endothelial-lined vascular spaces and vary from small incidentally found masses to large cavernous hemangiomas that are distinguished by large vascular spaces and lack of cellularity. Hemangioendothelioma is a subtype of hemangioma that is typically found in infants (see the images below). A female predilection for hemangioendothelioma is noted, with a female-to-male ratio of 4.3:1 to 2:1. CT scan appears of a hemangioendothelioma. Note the contrast enhancement around the periphery. 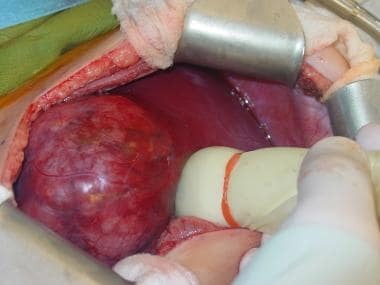 Intraoperative view during resection of a localized hemangioendothelioma. Laboratory abnormalities associated with this tumor include anemia, elevated aspartate transaminase levels, hyperbilirubinemia, and occasionally an elevated α-fetoprotein (AFP) level. The significance of an elevated AFP level is unknown because the levels can be elevated in healthy neonates and does not decrease to normal adult levels until age 6 months. Platelet sequestration and consumptive coagulopathy are rarely evident in these children (see Kasabach-Merritt Syndrome), and they may present with hemorrhage and respiratory distress. The natural history for hemangiomas is spontaneous regression in the first 2 years of life; however, treatment is required if cardiac failure or platelet consumption occurs. Several treatment options are available, and all are associated with potential severe complications and poor outcome. Initially, high-dose corticosteroids (3-5 mg/kg/d) are administered for 3-5 weeks. Supportive care may include liberal use of diuretics and digitalis to improve the cardiac function in cases of failure. Correction of anemia and coagulopathy is performed with blood product replacement. This regimen is discontinued if no response is observed, in order to avoid steroid-induced complications. Daily subcutaneous administration of interferon-alfa (3 million U/m2/kg) may lead to involution of hemangiomas located throughout the body. As much as 50% regression has occurred in some reports; however, the response time is slow, and lesions can rebound once the drug is stopped. Case reports have described spastic diplegia in very young children who have received interferon, but the actual risk of this therapy is unknown. Other treatment options include aminocaproic acid, vincristine, and cyclophosphamide. [9, 10, 11] Aminocaproic acid may be used in addition to cryoprecipitate to ameliorate the coagulopathy associated with Kasabach-Merritt syndrome, and antineoplastics may inhibit the proliferation and subsequent extension of the hemangioma. Radiation therapy is usually avoided because angiosarcomatous degeneration of benign hemangiomas following radiation and spontaneously occurring have been reported. Rarely, liver transplantation may be indicated for diffuse disease that is unresponsive to steroid and interferon therapy. 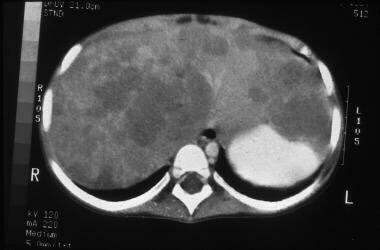 Mesenchymal hamartomas are rare tumors, comprising only 6% of liver tumors in children. They can be considered to be more of a malformation than true tumors, although they present as masses with their organ of origin. They are typically diagnosed when the patient is younger than 2 years. They usually grow during the first few months of life, then may stabilize, grow, or regress. These tumors are more common in the right lobe of the liver. They are often multicystic, heterogeneous, confined to one lobe, and asymptomatic. Typical appearance of a mesenchymal hamartoma during resection. Gross image of the mesenchymal hamartoma specimen after resection. 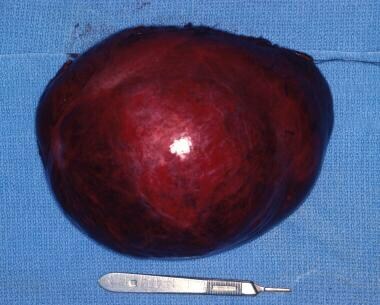 Intraoperative image of a mesenchymal hamartoma. Focal nodular hyperplasia (FNH) and hepatic adenomas are rarely seen in childhood. Both of these benign lesions have an association with a high estrogen environment and frequently occur in adolescent girls. Hepatic adenomas are associated with oral contraceptive use. Signs and symptoms may be absent or are nonspecific and include abdominal pain and mass symptoms. A characteristic central scar on CT scan is pathognomonic for FNH. Unenhanced CT scans reveal a hypodense well-defined lesion (see the image below). A 3-phase CT scan is the optimal study to make the diagnosis of FNH, including an arterial phase, portal venous phase, and delayed images. During the arterial phase, an FNH lesion appears as an early contrast-enhanced homogenous lesion that becomes isodense with the normal liver parenchyma on delayed images. A less-enhanced central scar can be seen in less than 50% of lesions. Enhanced axial CT scan through the liver in the arterial phase in a 38-year-old woman referred for gallbladder scanning. The mass demonstrates intense enhancement. Image courtesy of Dr Ali Nawaz Khan, MBBS. Differentiating FNH from adenomas may require a technetium sulphur colloid scan, which reveals uniform uptake by FNH lesions. Hepatocellular carcinomas (HCCs) and hepatoblastomas (HBs) have been reported after a benign diagnosis on imaging studies. Open biopsy may be required for definitive diagnosis in rare circumstances, especially if observation is considered (see the image below). Intraoperative image of a focal nodular hyperplasia (FNH). FNH lesions have no malignant potential and are often asymptomatic. Many surgeons advocate elective resection to prevent spontaneous rupture and hemorrhage; however, other surgeons follow these lesions with serial ultrasonography monitoring. If the lesions are symptomatic or rapidly enlarging, complete surgical resection, embolization, or hepatic artery ligation may be used for treatment. 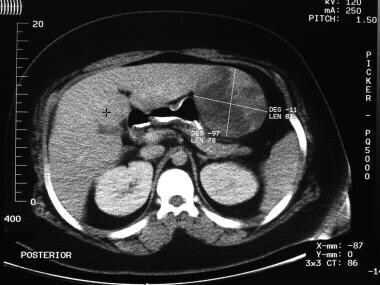 CT scan revealing hepatic adenoma arising from the left lobe of the liver. Intraoperative image demonstrating an hepatic adenoma. Associated laboratory finding abnormalities include an elevated α-fetoprotein (AFP) level and thrombocytosis. Genetic syndromes are associated with approximately 15% of HBs. An increased risk of HB is noted in association with hemihypertrophy and Beckwith-Wiedemann syndrome, which indicates possible involvement of a chromosome 11 deletion. In addition, an increased incidence of HB is associated with familial adenomatous polyposis syndrome as well as case series of HB associated with trisomy 18. Future whole-genome sequencing may elucidate the combination of genetic and epigenetic changes that drive tumorigenesis in HB. The workup begins with an abdominal ultrasonography to localize the mass and estimate the extent of tumor within the liver. Doppler evaluation can be used to evaluate the patency of the inferior vena cava, the hepatic veins, and the portal vein. CT scanning of the abdomen and chest is used to assess resectability and evaluate for the presence of pulmonary metastasis (see the images below). Hepatic angiography or MRI angiography is frequently helpful preoperatively to determine resectability because it delineates the vascular anatomy more precisely. 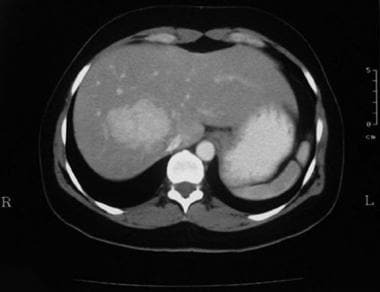 CT scan of a hepatoblastoma amenable to surgical resection. 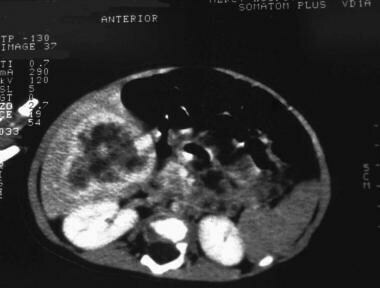 CT scan showing a hepatoblastoma present in multiple liver segments that is not amenable to surgical resection at the time of presentation. HB histologic subtypes may impact on prognosis. In one series, the pure fetal hepatoblastoma subtype demonstrated 50% survival in compared with those who had fetal and embryonal histology (30% survival). A recent Children's Oncology Group (COG) study has shown that complete resection of stage I patients with pure fetal histology are cured with surgery alone and require no chemotherapy. Multiple staging systems are used worldwide. In the United States, staging of tumors is based on the extent of tumor and outcome of surgical resection as critical criteria. Histologic subtype also plays an important role in survival. Future COG protocols plan to introduce a risk-based determination of treatment, with low, intermediate, and high-risk categories. These categories will also aid in follow-up and prognosis. COG protocols have introduced a risk-based determination of treatment with very low-, low-, intermediate-, and high-risk categories. These categories have aided in follow-up and prognosis. Already, they have discovered that the very low–risk group is cured with surgery alone and no longer requires adjuvant chemotherapy. Recently, the pretreatment and presurgery system used in the study of the International Society of Pediatric Oncology on Childhood Liver Tumors (SIOPEL) is being used by COG for the next clinical study. 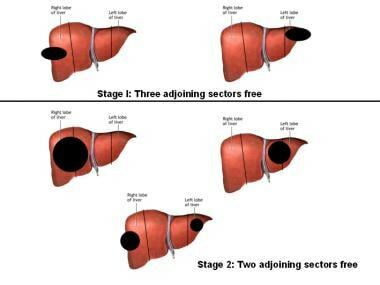 [20, 22] This system divides the liver into 4 sectors: the anterior and posterior on the right side, and the medial and lateral sectors on the left. These have been derived from Couinaud's system of liver segmentation. The right anterior consists of segments 5 and 8, and the right posterior consists of segments 6 and 7. The left lateral consists of segments 2 and 3, and left medial consists of segments 4a and 4b. Involvement of the caudate lobe (segment 1) is given separate staging consideration, as are extrahepatic disease, tumor focus, tumor rupture, distant metastasis, lymph node involvement, portal, hepatic, and inferior vena cava (IVC) involvement. Sectors of the liver with tumor location based on the International Society of Pediatric Oncology on Childhood Liver Tumors (SIOPEL) study. Complete surgical resection remains the goal of current therapy for HB for cure. Two main strategies for approaching resection of the tumor are noted. In the United States, the bias is towards early resection of tumor at diagnosis. Proponents of this therapy argue that the cumulative toxicity of chemotherapy can be reduced, some agents can be entirely avoided, and a reduction of in vivo development of tumor resistance may also occur. An opportunity to delay resection until after neoadjuvant therapy is observed in patients with stage III and IV tumors. Approximately 50% of tumors are deemed unresectable at diagnosis and require chemotherapy before definitive resection can be performed. Characteristics of an unresectable tumor include multicentricity, invasion of the IVC or portal vein, or distant metastases. Isolated pulmonary metastases that persist after neoadjuvant chemotherapy may be treated with pulmonary metastasectomy. Adequate response to chemotherapy is observed in 70% of patients who then go on to complete resection followed by additional postoperative chemotherapy. Resection of tumors that are multifocal or have major venous involvement should be considered only in selected centers with the capabilities for appropriate postoperative care and the ability to provide for transplant, should that option become necessary. Major complications following resection have been reported to be as much as 20-30%, with complications following resection of HB more prevalent than complications after resection of hepatocellular carcinoma (HCC). HCC accounts for 23% of pediatric hepatic malignancies and typically presents in 2 incidence peaks: the first is at age 0-4 years and the second is at age 10-14 years. Predisposing conditions include hepatic fibrosis and cirrhosis secondary to metabolic liver disease, viral hepatitis, extrahepatic biliary atresia, total parenteral nutrition, and chemotherapy-induced fibrosis. Resection of a hepatocellular carcinoma of the right lobe. Metastases usually occur in the lung and lymph nodes. The workup and staging are similar to those used in HB. More than 70% of these tumors are considered unresectable at the time of presentation and, unlike HB, respond poorly to chemotherapy. Combination chemotherapy, as is used for HB, has been administered to patients with HCC but has been largely ineffective in shrinking tumors to the point of respectability and in eradicating metastases. Vincristine, cisplatin, 5-fluorouracil (5-FU), and doxorubicin have had little impact on the progression of this disease. 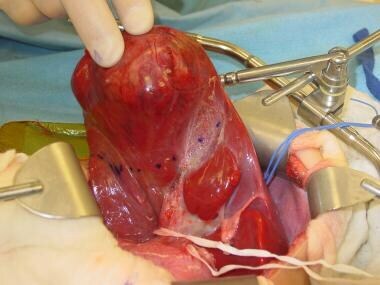 Complete surgical resection or transplantation is often the only chance for cure. Newer therapeutic strategies have included chemoembolization, intra-arterial chemotherapy, and intraoperative cryotherapy. The overall survival rate remains poor, with a recent Surveillance, Epidemiology, and End-Results (SEER) database review showing 5-, 10-, and 20-year survival rates of 24%, 23%, and 8%, respectively. Children with initially resectable disease have a much better prognosis than those who present with advanced or disseminated disease. Other primary liver tumors include undifferentiated sarcoma, biliary rhabdomyosarcoma, angiosarcoma, and rhabdoid tumors. 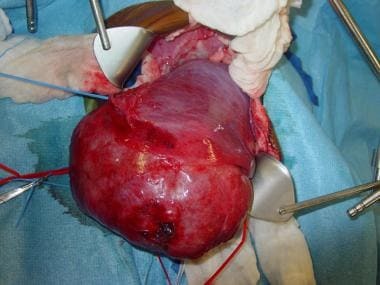 Complete surgical resection of malignant hepatic tumors is considered a key part of attempt at cure. Planning a major hepatic resection begins with adequate imaging studies to ensure resectability. Doppler ultrasonography used in combination with MRI provides valuable information regarding the vascular and biliary anatomy. The PRETEXT system was developed by the International Society of Pediatric Oncology on Childhood Liver Tumors (SIOPEL) group to identify suitable candidates for primary resection. This system is being adopted internationally to provide a universal language for surgeons and will be helpful for those who see such cases infrequently. Resection is typically performed through a bilateral subcostal incision, and, occasionally, a right thoracoabdominal approach is necessary for large lesions arising high in the right lobe. Surgical resection has seen applications of newer technology. Intraoperative ultrasonography has been widely applied to determine the exact location of the tumor relative to the vessels. Once deemed resectable, the resection is marked out, and various tools may then be used to perform the resection; electrocautery, bipolar devices such as LigaSure, and argon beam coagulation for hemostasis have been used. See the images below. Intraoperative ultrasonography used to assess resectability of a right lobe hepatoblastoma. The lesion to resect is marked out. Electrocautery is useful for dissecting through the liver capsule and parenchyma. Bipolar cautery may be useful in sealing blood vessels and hepatic ducts. Argon beam coagulation is used to assist with hemostasis of the raw hepatic parenchyma. Laparoscopic and robotic resections of both benign and malignant liver tumors have been described. Their role in standard practice is still being defined. Unresectability is usually determined by involvement of hilar structures or all hepatic veins, multicentricity, and invasion of inferior vena cava (IVC) or portal vein. Centrally located tumors are, by definition, more likely unresectable. The most frequently performed procedure is a right hepatectomy (60%) because hepatoblastomas (HBs) occur 3 times more often in the right lobe than in the left. The hilar plate is divided, exposing the bifurcation of the hepatic artery and portal vein. These structures are ligated. The right hepatic vein is identified and ligated before any division of the hepatic parenchyma. In an extended right hepatectomy, the middle hepatic vein is ligated and segment 4 is resected. At completion, only segments 2 and 3 and the caudate lobe remain. Left hepatic lobectomy begins the same way right hepatectomy, with division of the left hepatic artery and left branch of the portal vein. The left and middle hepatic veins are identified after dissection through the sinus venosus. 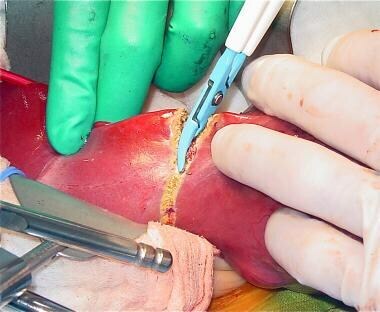 The liver is then transected after vascular isolation of the resected segments. 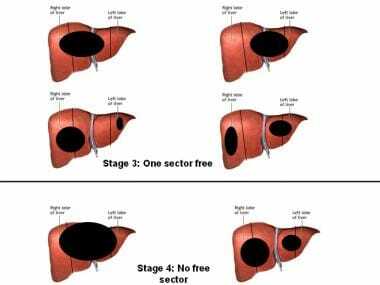 An extended left hepatectomy includes removal of all or most of segments 5 and 8. Major intraoperative complications include hemorrhage, air embolism, tumor embolus, and bile duct injury. Postoperative complications include hemorrhage, bile leak, abscess formation, pulmonary complications, and wound problems. Only 20% of the liver is necessary to maintain hepatic function; thus, postoperative insufficiency is rare. Postoperative care consists of adequate fluid replacement, intravenous albumin supplementation, vitamin K, and clotting factors for the first 3-4 days. The liver function test results generally normalize within the first 2 weeks, and hepatic insufficiency is reasonably rare. Postoperative monitoring consists of frequent ultrasonography, chest radiography, and serial α -fetoprotein (AFP) level measurements, generally at 3-month to 6-month intervals. The survival rate after liver transplantation in children with malignant tumors (ie, HB and HCC) at a single center has been reported as 91% at 1 year and 5 years and 82% at 14 years, respectively. More generally, the 5-year survival rate for patients transplanted for HB is 70%. The role of liver transplantation for HCC is more controversial. The criteria currently used to evaluate adult transplant candidates may not be applicable for pediatric patients. Because no good medical therapy for pediatric HCC has been identified, liver transplantation should be carefully evaluated as front-line therapy. A study of the United Network for Organ Sharing (UNOS) database reported 135 patients undergoing 135 transplants for HB and 43 transplants for HCC with 1-year, 5-year, and 10-year survival of 79%, 69%, and 66% for HB, respectively, and 86%, 63%, and 58% for HCC, respectively. The primary cause of death for both groups was metastatic disease. The availability of donor organs has increased with the use of split-liver grafting and other "technical variant" techniques, along with living-related liver transplant techniques. 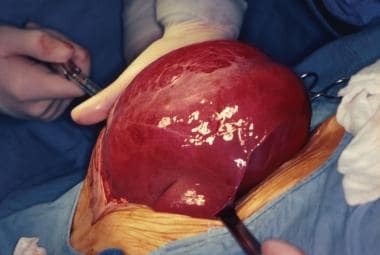 Prognosis in terms of graft and patient survival appear to be the same between full-size liver and technical variant liver transplants; however, morbidity following transplant appears to be higher in those patients who receive technical variant grafts. Generally, preoperative and postoperative chemotherapy are recommended, in addition to postoperative immunosuppression. 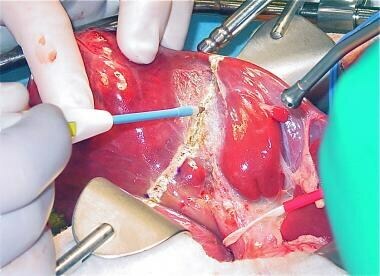 Early failure of liver transplant (< 30 d) is usually due to vascular complications or primary nonfunction. Late failure is usually more a result of infection, posttransplant lymphoproliferative disease, chronic rejection, biliary complications, or recurrence of malignant disease. These failures may warrant retransplantation. The predictors of success after retransplantation remain unknown. Isaacs H Jr. Fetal and neonatal hepatic tumors. J Pediatr Surg. 2007 Nov. 42(11):1797-803. [Medline]. Kochin IN, Miloh TA, Arnon R, Iyer KR, Suchy FJ, Kerkar N. Benign liver masses and lesions in children: 53 cases over 12 years. Isr Med Assoc J. 2011 Sep. 13(9):542-7. [Medline]. Meyers RL. Tumors of the liver in children. Surg Oncol. 2007 Nov. 16(3):195-203. [Medline]. Huang SA, Tu HM, Harney JW, et al. Severe hypothyroidism caused by type 3 iodothyronine deiodinase in infantile hemangiomas. N Engl J Med. 2000 Jul 20. 343(3):185-9. [Medline]. Lee TC, Barshes NR, Agee EE, et al. Resolution of medically resistant hypothyroidism after liver transplantation for hepatic hemangioendothelioma. J Pediatr Surg. 2006 Oct. 41(10):1783-5. [Medline]. Darrow DH, Greene AK, Mancini AJ, Nopper AJ, SECTION ON DERMATOLOGY, SECTION ON OTOLARYNGOLOGY-HEAD & NECK SURGERY, et al. Diagnosis and Management of Infantile Hemangioma: Executive Summary. Pediatrics. 2015 Oct. 136 (4):786-91. [Medline]. Ehren H, Mahour GH, Isaacs H Jr. Benign liver tumors in infancy and childhood. Report of 48 cases. Am J Surg. 1983 Mar. 145(3):325-9. [Medline]. Vergine G, Marsciani A, Pedini A, et al. Efficacy of propranolol treatment in thyroid dysfunction associated with severe infantile hepatic hemangioma. Horm Res Paediatr. 2012. 78(4):256-60. [Medline]. al-Rashid RA. Cyclophosphamide and radiation therapy in the treatment of hemangioendothelioma with disseminated intravascular clotting. Cancer. 1971 Feb. 27(2):364-8. [Medline]. Perez Payarols J, Pardo Masferrer J, Gomez Bellvert C. Treatment of life-threatening infantile hemangiomas with vincristine. N Engl J Med. 1995 Jul 6. 333(1):69. [Medline]. Warrell RP Jr, Kempin SJ. Treatment of severe coagulopathy in the Kasabach-Merritt syndrome with aminocaproic acid and cryoprecipitate. N Engl J Med. 1985 Aug 1. 313(5):309-12. [Medline]. Draper H, Diamond IR, Temple M, John P, Ng V, Fecteau A. Multimodal management of endangering hepatic hemangioma: impact on transplant avoidance: a descriptive case series. J Pediatr Surg. 2008 Jan. 43(1):120-5; discussion 126. [Medline]. Srouji MN, Chatten J, Schulman WM, Ziegler MM, Koop CE. Mesenchymal hamartoma of the liver in infants. Cancer. 1978 Nov. 42(5):2483-9. [Medline]. Dehner LP, Parker ME, Franciosi RA, Drake RM. Focal nodular hyperplasia and adenoma of the liver. A pediatric experience. Am J Pediatr Hematol Oncol. 1979 Spring. 1(1):85-93. [Medline]. Foster JH, Berman MM. The malignant transformation of liver cell adenomas. Arch Surg. 1994 Jul. 129(7):712-7. [Medline]. Lack EE, Ornvold K. Focal nodular hyperplasia and hepatic adenoma: a review of eight cases in the pediatric age group. J Surg Oncol. 1986 Oct. 33(2):129-35. [Medline]. Agarwala S. Primary Malignant Liver Tumors in Children. Indian J Pediatr. 2012 Mar 1. [Medline]. Haeberle B, Schweinitz D. Treatment of hepatoblastoma in the German cooperative pediatric liver tumor studies. Front Biosci (Elite Ed). 2012 Jan 1. 4:493-8. [Medline]. Albrecht S, von Schweinitz D, Waha A, Kraus JA, von Deimling A, Pietsch T. Loss of maternal alleles on chromosome arm 11p in hepatoblastoma. Cancer Res. 1994 Oct 1. 54(19):5041-4. [Medline]. De Ioris M, Brugieres L, Zimmermann A, et al. Hepatoblastoma with a low serum alpha-fetoprotein level at diagnosis: the SIOPEL group experience. Eur J Cancer. 2008 Mar. 44(4):545-50. [Medline]. D'Antiga L, Vallortigara F, Cillo U, et al. Features predicting unresectability in hepatoblastoma. Cancer. 2007 Sep 1. 110(5):1050-8. [Medline]. Meyers RL, Katzenstein HM, Krailo M, McGahren ED 3rd, Malogolowkin MH. Surgical resection of pulmonary metastatic lesions in children with hepatoblastoma. J Pediatr Surg. 2007 Dec. 42(12):2050-6. [Medline]. Venkatramani R, Stein JE, Sapra A, Genyk Y, Jhaveri V, Malogolowkin M, et al. Effect of neoadjuvant chemotherapy on resectability of stage III and IV hepatoblastoma. Br J Surg. 2015 Jan. 102 (1):108-13. [Medline]. Castellino AM. Children With Hepatoblastoma: Could Less Chemo Be Used?. Medscape Medical News. Available at http://www.medscape.com/viewarticle/834435#vp_1. November 05, 2014; Accessed: September 15, 2016. Meyers RL, Tiao GM, Dunn SP, Langham MR Jr. Liver transplantation in the management of unresectable hepatoblastoma in children. Front Biosci (Elite Ed). 2012 Jan 1. 4:1293-302. [Medline]. Pham TH, Iqbal CW, Grams JM, et al. Outcomes of primary liver cancer in children: an appraisal of experience. J Pediatr Surg. 2007 May. 42(5):834-9. [Medline]. McAteer JP, Goldin AB, Healey PJ, Gow KW. Surgical treatment of primary liver tumors in children: outcomes analysis of resection and transplantation in the SEER database. Pediatr Transplant. 2013 Dec. 17(8):744-50. [Medline]. Su WT, Rutigliano DN, Gholizadeh M, Jarnagin WR, Blumgart LH, La Quaglia MP. Hepatic metastasectomy in children. Cancer. 2007 May 15. 109(10):2089-92. [Medline]. Randolph JG, Altman RP, Arensman RM, Matlak ME, Leikin SL. Liver resection in children with hepatic neoplasms. Ann Surg. 1978 Jun. 187(6):599-605. [Medline]. Starzl TE, Groth CG, Brettschneider L, et al. Orthotopic homotransplantation of the human liver. Ann Surg. 1968 Sep. 168(3):392-415. [Medline]. Al-Qabandi W, Jenkinson HC, Buckels JA, et al. Orthotopic liver transplantation for unresectable hepatoblastoma: a single center's experience. J Pediatr Surg. 1999 Aug. 34(8):1261-4. [Medline]. Stringer MD. The role of liver transplantation in the management of paediatric liver tumours. Ann R Coll Surg Engl. 2007 Jan. 89(1):12-21. [Medline]. Avila LF, Luis AL, Hernandez F, et al. Liver transplantation for malignant tumours in children. Eur J Pediatr Surg. 2006 Dec. 16(6):411-4. [Medline]. Austin MT, Leys CM, Feurer ID, et al. Liver transplantation for childhood hepatic malignancy: a review of the United Network for Organ Sharing (UNOS) database. J Pediatr Surg. 2006 Jan. 41(1):182-6. [Medline]. Sieders E, Peeters PM, TenVergert EM, et al. Graft loss after pediatric liver transplantation. Ann Surg. 2002 Jan. 235(1):125-32. [Medline]. Lerut JP, Orlando G, Adam R, et al. The place of liver transplantation in the treatment of hepatic epitheloid hemangioendothelioma: report of the European liver transplant registry. Ann Surg. 2007 Dec. 246(6):949-57; discussion 957. [Medline]. Warmann SW, Frank H, Heitmann H, et al. Bcl-2 gene silencing in pediatric epithelial liver tumors. J Surg Res. 2008 Jan. 144(1):43-8. [Medline]. Lopez-Terrada D. Integrating the diagnosis of childhood malignancies. Adv Exp Med Biol. 2006. 587:121-37. [Medline]. Longitudinal ultrasonogram in a 38-year-old woman referred for a gallbladder scanning. Sonogram shows mass effect from the tumor, as demonstrated by the arching of the portal vein anteriorly. Image courtesy of Dr Ali Nawaz Khan, MBBS. 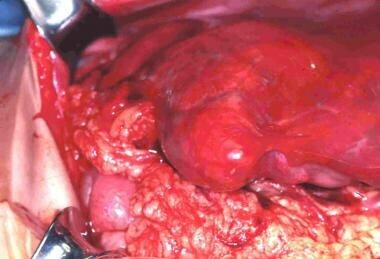 Hepatoblastoma found to be invading the inferior vena cava at the time of surgical exploration. 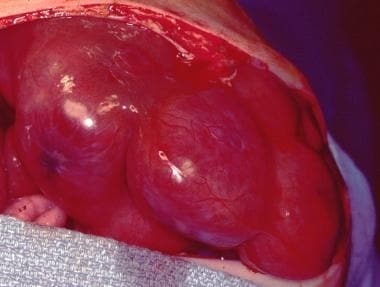 Laparoscopic view of a liver tumor. Patient had a large hepatoblastoma of the right liver lobe. Laparoscopic tumor biopsy was performed.